Thomas was born in Dublin on 29th July 1889 to Joseph (1859 – 26/04/1927) and Annie Teresa Brownrigg (nee Murphy 1864 – 1931). His parents were married in Cork in 1886. There was a probate for Thomas’ father dated 17th May 1927, leaving effects to Annie. There is a WW1 Medal Card for William showing that he first served as Private PS/2187 in the Middlesex Regiment and then as a Second Lieutenant in the East Lancashire Regiment. He also had this rank in the 12th Hants (Soton) Battalion of the Home Guard in WW2, serving from 1st February 1941. Arthur’s WW1 Medal Card shows that he first served as Private 06949 in the Army Ordnance Corps and then as Second Lieutenant in the Durham Light Infantry. Arthur married Dorothy L Harris (1898 – 1963) in Southampton in 1928. On the 1901 Irish Census Thomas is living with his family at 2 Finglas Road, Glasnevin, Dublin. Thomas was educated at Belvedere College, Dublin. The 1911 English Census show that Thomas’ mother is living with her daughters Margaret and Eleanor at 18 Waterloo Road, Southampton. William is a church student at St Joseph’s, Eskdale Avenue, Chesham. On the 1911 Irish Census there is a Thomas Brownrigg, of the same age and birthplace, who is working as a professor at St Colman’s College, Fermoy, County Cork. On his service papers for the Royal Flying Corps it states that in 1913 Thomas was a law student at The Honourable Society of Gray’s Inn, London. These papers also state that Thomas had knowledge of French and Military Law. When Thomas died his parent’s were living at Highcliff House, Highcliff Avenue, Cedar Road, Southampton. Thomas enlisted as a Private 3151 into the Inns of Court O.T.C. at Lincoln’s Inn, London on 1st April 1915. On his Attestation papers he originally put his address as ‘St Edmunds College, Ware, Hertfordshire’, but this was crossed through and his parent’s address was written instead, so he may have taught at the College. Thomas applied for an appointment to a Temporary Commission on 31st May 1915 and he was appointed to Temporary 2nd Lieutenant to the 15th Battalion Middlesex Regiment on 20th June 1915. On 14th May 1916 he transferred to the 13th Battalion Middlesex Regiment. He served in France until 14th February 1917 when he joined the Royal Flying Corps as an Observer and was sent to England for training. 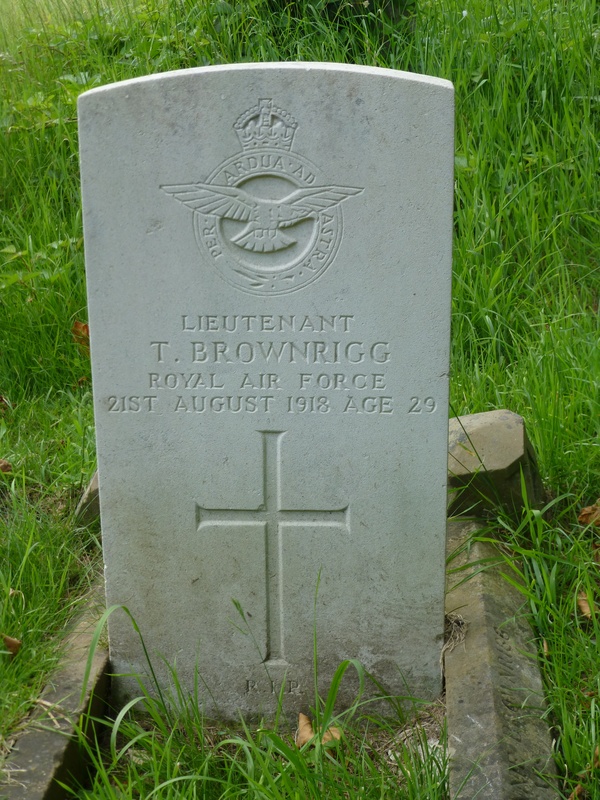 Whilst in this service Thomas achieved qualifications in Aerial Observation and Aerial Gunnery. There was a constant appeal for volunteers from the Army to join the RFC. Many men were transferred temporarily and usually worked as Observers but some soldiers were selected to train as pilots. The training usually took place in the UK. The initials ‘A & S’ refer to ‘Aeroplane and Seaplane’. On 6th April 1918 Thomas transferred to ‘28 Wing’ of the Royal Air Force and on 22nd June he was stationed at 16 Training Squadron, which was formed in the 7th Wing at Beaulieu on 15th December 1915. The Squadron moved to Yatesbury and 28th Wing on 30th October 1917 and disbanded into 37th Training Depot Station on 15th July 1918. Thomas was awarded the 1914 -1915 Star, the Victory and British War Medals. Thomas is buried at the Southampton Old Cemetery. Grave reference 181 D.48. This cemetery is on the Common and was made in 1846 under Act of Parliament. It contains 99 Commonwealth war graves of the 1914-18 War, a plot of 21 1914-18 War Belgians and 15 Commonwealth war graves of the 1939-45 War. Thomas is also remembered on the War Memorial of Belvedere College, Dublin and on the 1914 – 1918 War memorial at the Gray’s Inn Chapel. Arthur Christopher Brownrigg s Joseph m Dorothy Lilian Harris d Samuel 9 April 1928 St Edmund’s RC church by Fr Bernard Lindsay. Witnesses William Xavier Brownrigg and Winifred May Harris. William Xavier Brownrigg m Lindsay Brenda Williams Drove on 23rd December 1926 also at St Edmund’s by Fr Bernard. Witnesses Annie Teresa Brownrigg and Jessie Drover. 1. William public school btn June 1915, October 1916 2nd Lt, Dec 1916 wounded. 2. Arthur June 1915 AOC. 3. Thomas May 1915 OTC, August 1915 commission in 15th btn Middlesex regiment.